I've been a student of Right Knowledge since the early 90s. I say that to say that I'm very familiar with Zecharia Sitchin and the Right Knowledge explanation of Nibiru and the reformation of this planet. I've read all the Earth Chronicle books of Sitchin. My question is, how does this tie into the Flat Earth theory and the Dome that is suppose to be over the planet? MY theory is that if Flat Earth is true, then the Dome is most likely a electromagnetic shield formed by the 4 winds ( spacecraft) that are at the four corners of the planet. Thoughts on this? Man’s concept of a flat earth surrounded by a great firmament (waters) is archaic. Land surrounded by water is described in the pyramid/coffin texts as ASAR. Geometrically, this is the great circle that encircles Hw-Nbwt. As radiant energy penetrates the several atmospheres (waters) of earth, it bends in and encircles hw-nwt or hoo naboot, which has been translated as LAND. This is how man is able to see using his sense of sight and for a true human, to a higher vibration, sees using his crystal palace (i.e., pineal gland activation). You see, Asar is the Great King who is to be lifted up, one born of the sky (noot), the radiant energy encircling the land. Laymen are taught this great knowledge in the Holy Bible (El Bib Yloh or al-bab ilah, in reflection). “In the beginning Elohim created the heavens and the earth. And the earth was without form, and void (flat earth theory); and darkness was upon the face of the deep. And the Spirit of Elohim moved upon the face of the waters (Great Circle). And Elohim said, Let there be light: and there was light (Gen 1 v 1-3))." Flat Earth Theory Fact or Fiction? Long, long ago, my ancestors of turtle island viewed the earth as a flat disc of water with a very large land mass floating in the middle. The earth is suspended by four cords (north, south, east, and west) from an arch in the sky made of crystal-quartz. The four cords are similar in application to the four fundamental interactions in Physics, and to a lesser frequency, echoed in the book of revelations as the four winds held by the four angles. Earth is the middle or inner-world stationed between over-worlds and under-worlds, so to speak. Kosmically, there are 13 over-worlds and 9 under-worlds. Protective spirits of true humans (naba) live in the over-worlds, from which they move into the inner-world to restore balance and order (ma’at) upon the earth in times of disaster, pain, and chaos. The women have called for messiahs. That time has now come. And many protective spirits have incarnated in true humans to help guide humanity and restore order on turtle island and teach of the Great Peace. Wadu Tamareans. Last edited by Pa Neter Ra; at 08:39 PM.. The Flat Earth Paradigm Fact or Fiction? It is apparent that The Ancient Ones had a uniform message for conveying the flat earth paradigm. From ancient Mesopotamia and the Nile to the Americas of the extreme west (Maghrib Al-Aqsa), the flat earth paradigm is/was a universal representation and communication of cosmogony; just as the layout of Gizah (Egipt) is uniform with the layout of Teotihuacan (Mexico), which corresponds with the belt of Orion in the great expanse called FIRMAMENT (as above, so below). However, the contemporary world sees the world through the lens of "Renaissance Man" and not True Man (naba). The lens of man can get distorted in time and thus he must be calibrated to a Standard (cosmically). Sufism teaches man about gradients of certainty (yaqin). There are three gradients of truth to arrive at accurate, doubt-free knowledge through exact verification. 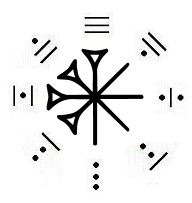 In Nuwaupu (13 x 9), all Nuwaupians experience this verification process through the acceptance of FACTS and the scientific method (ontology) known as “The Science of Sound Right Reason (Evidence, Experience, and Reason).” One can learn more about the testing of knowledge in the scroll “What is Nuwau-Bu?” In the Moorish American paradigm, the Holy Koran Circle 7, Chapter 7, Moors learn the meaning of TRUTH (Facts). In it, there is also a uniform and redundant lesson about arriving at TRUTH, in the context of SALVATION. What man thinks, perhaps, is truth is called belief. What man knows is truth is called faith. Knowledge of self (Man Know thyself), the truth, is called fruition. Belief is lost in faith, which it (faith) is then lost in fruition. One must learn how to defy logic (gravity) to embark on the journey to be one with the ALL (El Kuluwm), the ultimate return and reality. With that said. 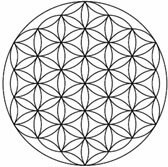 I will provide a clue to your quest-ion using the cube of Metatron (Matatrun) or as it is known in esoteric paradigm as The Flower of Life. The motif one sees above is in a PLANE i.e. two-dimensions (X-Y). As he or she gazes at the motif, the interlaced circles transpose and form a cube in SPACE i.e. three-dimensions (X-Y-Z). What at first glance appeared to be a FLAT motif, has now taken SPACE in the MIND’s eye articulated with electrical and magnetic pulses aggregated in the cavity of the brain. All is Mind. The fundamental principle of the doctrine of Mentalism is that the ALL is living Mind (spirit) and the universe is a mental creation of the ALL. The Round Earth, for instance, is a mental creation of the ALL into which it is subject to the laws of manifested things into which we live, move, and have our very own existence (each with a mind) shaped by the Earth’s Mind via electric energy and magnetic ley lines. Gravity, one of the four fundamental forces, is liken to logic and is thus subordinate to the Mastery of the Mind. Thus, to achieve Mastery of the Mind, one must learn to defy Gravity (logic). Last edited by Pa Neter Ra; at 06:11 AM..